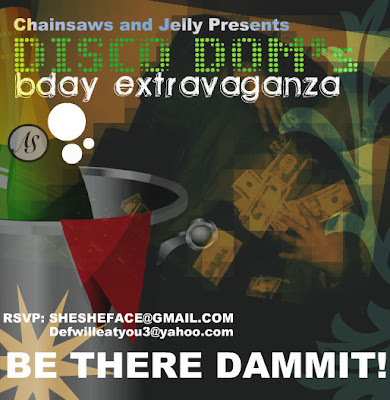 Chainsaws and Jelly: Disco Dom's Extravaganza! This right here is THEEEE birthday party. It gets 2 fliers and Chainsaws and Jelly presents. Please e-mail for all the information. Now remember kiddies, you MUST dance and you MUST have loads of fun. Please bring your own beers, snacks, and whatever you need to party. Get at me people for the address! Disco Dom's Extravangaza..straight outta Jersey! I'ma bust the "WOP" when I walk in, then I'll go hide in the corner with my 40's!! !